As a result of the strategic business relationship with Autodesk, Topcon Positioning Group announces improved workflow compatibility for the GLS-2000 3D laser scanner and ScanMaster software with Autodesk solutions via the latest version of Autodesk ReCap. The GLS-2000 pairs with Topcon ScanMaster software to collect, process, edit and deliver 3D point cloud data from a laser scanner for a variety of applications. Autodesk ReCap allows users to perform tasks such as scan conversion, editing, and viewing point cloud data — and provides integration with Autodesk’s broader portfolio of design software. Autodesk ReCap and ReCap 360 have the new capability to read the Topcon CL3 format as a scan file in addition to a standard point cloud. The scan file allows for the use of individual scan positions for additional options in registration workflows. The integration is available for versions including Autodesk ReCap, ReCap 360 and ReCap 360 Ultimate software. Topcon Positioning Group is headquartered in Livermore, California, USA (topconpositioning.com). 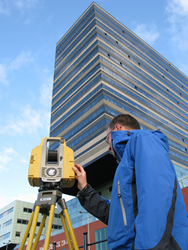 Its European head office is in Capelle a/d IJssel, the Netherlands (topcon-positioning.eu). Topcon Positioning Group designs, manufactures and distributes precise positioning products and solutions for the global surveying, construction, agriculture, civil engineering, BIM, mapping and GIS, asset management and mobile control markets. Its brands include Topcon, Sokkia, Tierra, Wachendorff Elektronik, Digi-Star and 2LS. Topcon Corporation (topcon.com) was founded in 1932. Autodesk, the Autodesk logo, ReCap and ReCap 360 are trademarks or registered trademarks of Autodesk, Inc. and/or its subsidiaries and/or affiliates, in the USA and/or other countries. All other brand names, product names, or trademarks belong to their respective holders.